Background: Meditation brings calmness to the mental activities and develops the internal awareness. It can be helpful in reducing stress and anxiety in student community and academicians. 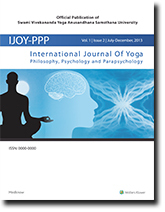 Aims: The aim was to measure the outcomes of cyclic meditation (CM), yogic relaxation technique, when compared to supine rest (SR). We examine reduction in anxiety, using Spielberger's State-Trait Anxiety Inventory (STAI). Materials and Methods: A total of 60 high school students (both genders) participated in this study, aged between 13 and 16 years (group average age ± standard deviation, 14.78 ± 1.22 years). They were attending 10 days yoga training course during their summer vacation. Those children's, who had English as the main medium of instructions, were included. They acted as their own controls. They were divided into two groups and tested on the STAI, immediately before and after 22:30 min of practice of CM on 1 day, and immediately before and after an equal period of SR on the other day. For the assessment, the first group performed CM on day 9, and SR on day 10. For the second group, the order was reversed. Results: There was a significant reduction on STAI scores within group (pre and post) of CM (4.27%, P = 0.016) session and no change in SR session. Further, subgroup analysis based on gender revealed that the female group had a significant reduction following both sessions, but male group had nonsignificant reduction in STAI score. The female group found significantly differs from the male group in STAI score on both the sessions. Conclusions: The CM found to be a useful technique to combat the state of anxiety with different magnitude of changes in gender subgroups. The female group was benefitted more by following both CM and SR sessions compared with male group. The Indian perspective of personality deals with the tri-dimensional classification of Gunas (Sattva, Rajas, and Tamas) entailing physical, mental, and spiritual elements of personality. The present study aims to examine the relationship between Gunas and well-being indicators such as psychological capital, personality, life satisfaction, and subjective happiness. The study was conducted on two samples. Vedic Personality Inventory  and Mental Health Continuum-Short Form  were administered to both samples. The first sample consisted of 80 Indian professionals (males = 51 and females = 29) with mean age = 28.8 years (SD = 7.19) who were administered Psychological Capital Questionnaire  and Big-Five Personality Inventory  and the second sample consisted of 110 students (males = 82 and females = 28) with mean age = 21 years (SD = 2.72) who were administered Satisfaction with Life Scale  and Subjective Happiness Scale. Across both studies, Sattva was found to be positively correlated with well-being. Rajas and Tamas were negatively correlated with well-being. Higher levels of Sattva and well-being were reported in the older age-group. Males scored higher on Rajas while no gender differences were found in well-being. Introduction: Āsana is an important constituent of Yoga. The impact of Anantasamāpatti, a technique for the practice of āsana prescribed by patañ jali, in the practice of Yogāsana remains to be scientifically assessed. Scientific verification presupposes conceptual clarity. A cursory survey of contemporary interpretations reveals that Anantasamāpatti has been represented variously. Objectives and Method: In the light of this contemporary uncertainty, effort is made to refer to and analyse the traditional view point which is preserved in the form of Sanskrit commentaries regarding the meaning and mechanism of working of this technique to assist better understanding and implementation of this most ancient technique in the practice of Yogāsana. Result: Contemporary uncertainty regarding Ananatasamāpatti seems to stem from traditional sources. Conclusion: Based on the literary evidences Ananta is the probable reading and the meaning seems to be Śeṣa. Samāpatti is visualization of oneself as firm and strong like Śeṣa. The mechanism of working seems to be the effect of the mental visualization on physical firmness. And this requires to be practiced along with prayantaśaithilya. Background: The present study was intended to study, "the immediate effect on the psycho-physiological changes after practices set of asanas." The objectives of this study were to investigate the effect of yogasanas on: Psychological change (stress level) and physiological changes (energy and function of organs). Methods: A total of 21 male volunteers with age range (18-30 years) were investigated. They were all residential students of a Yoga University (S-VYASA University, Bengaluru). They have been practicing yoga for last 1 year. Design: This was a self as control study; all the participants were assessed before and after the intervention to measure the psycho-physiological variables. Assessments: (i) Psychological change (stress level) and (ii) physiological change (energy and function of organs). Intervention: The intervention consisted a series of eight yoga postures. Data Analysis: Data were analyzed using the Wilcoxon sign rank test for (pre and post) assessments. Results: There were no significant changes after yoga practices in the experimental and control session. The activation coefficient, an integral entropy, and integral area were compared to their baseline scores. Conclusion: Mild psychological stress level increased immediately after the yoga session compared to control session. At the same time, the disorder in the regulation of physical functions decreased after the yoga session compared to control session. In further study other variable of gas discharge, visualization might be included for better understanding.